1.2 Will you get caught? 1.7 So you think you want to write a Wikipedia article? Be Seen, Be Read was a workshop at Loughborough University which took place in September 2014. The workshop aimed to inform attendees about the advantages of free licensing to academia and the attendees own ambitions for themselves and their research. Copyright means simply the right to copy, that is the right for someone to print an original work. It evolved in British law as a device to allow authors to ensure that others would not print and sell their works without permission. The advantage for the nation would be that it would aim to encourage more people to invest the intellectual effort in the creation of new work. Copyright law has been developed since its creation in 1709 in both its complexity and its jurisdiction. However some ideas are central. Copyright is not about inventions - so you cannot copyright a new corkscrew and you cannot copyright the idea of Batman. You cannot copyright facts - so you cannot claim copyright on your grandmother's recipe. You can claim copyright on the 27th issue of Detective Comics and by implication the first description of the concept of Batman. Because of this, the image shown here is considered "fair use" of the image as a copy of this magazine is worth about $1m. You cannot copyright the measurements that you have taken which allow you to make a map, but you can copyright your map because its an interpretation of that data. One of the best and worst parts of this law was the automatic right to copyright. You cannot copyright a few words, a slogan or a catch-phrase - but if you write an original piece of work you do not need to apply for copyright - it is given to you as a result of your creation. If you write an original sentence then it automatically gains copyright as soon as it is committed to a permanent medium. This is illustrated by the idea of Poor man's copyright where you place your poem in a sealed envelope and post it to yourself. The idea being that the postmark serves as proof of the date of its creation. This means that if you see a few sentences of your work that are published without your permission then the civil law will uphold your rights for them to decease and pay damages. Mrs. Tiggy-winkle with Jenny Wren's wine-stained table cloth - Can someone claim copyright on this image by Beatrix Potter? This idea is extended to images, sculptures and academic papers. Copyright does not prevent people from writing about your idea at length but they cannot reproduce it. They cannot steal your images, your text or your atomic model diagram if it has some originality. If they recreate your interpretation of those ideas then you are entitled to damages. It does not matter if they attribute your text they are still not allowed to do it. This protection however is only offered for a finite time, although this term has been made longer and longer and these rights are inheritable. Currently the rights in the UK, USA and Europe is the lifetime of the author plus 70 years. So that 1880 photo MAY be in copyright. Copyright also prevented others from exporting your work from your country. This was required as pirate publishers arose who would take a copyrighted work and then republish it in another country. This ban on export protected publishers internationally and millions of books and paintings and other intellectual creations have enjoyed the creation of copyright. An unfortunate by-product of international copyright law is that it encourages publishers to base themselves where there is good copyright protection. The vast majority of paper books and academic papers were published in several sites like London and New York. This means that a small number of countries have historically owned and controlled the world's intellectual effort. The automatic creation of copyright worked well when the lone poet could, in confidence, approach publishers knowing that her rights were protected whilst a deal was discussed. Once the contract was agreed then the publisher could sell the poet's creations and the profits would pay for the publisher's work and reward the owner of the copyright for their speculative investment. Anyone who saw that work and wanted to re-publish or translate that poem had just to write a letter to the publisher and within a few days they may have received permission or started negotiations to use that poem. Therefore, this is a concept that was originally intended for British books. However, the law was copied by various countries and eventually there were growing international agreements. e.g. copyright in the European Community is life plus 70 years except for Spain where it is Life+80 years. Dr Marianne Bamkin and the author wrote a village pantomime script, entitled "Peter Pantomime", which was performed at their local village hall in aid of local voluntary groups . The story involved children who spent too much time on the internet so they were sucked into a web site called "Never-land" where they met the other "Lost Boys", who had made the same mistake. 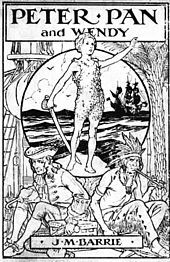 The story was loosely based on Peter Pan but the authors of the Pantomime had checked that the author had been dead for 70 years. Unfortunately there is one exception to the UK law and that is Peter Pan. We were contacted by the copyright holders and we were "invited to make a donation". It could be that the copyright owners were reading the Derby Telegraph but its more likely that the were using Google Alert. It has been proposed by the European Commission that large websites should have automatic copyright protection software. Wikimedia and the author see this as impractical and unhelpful. This logo is owned by the Pokemon Company and including it here is nominally illegal, unless I ask you - why? An important aspect of copyright from the beginning was the idea of "fair use". When DC Comics created a new hero they would then want everyone to write about the new idea. However, people were deterred from doing so by the threat of infringing DC comics' copyright. This situation benefited no one. They could not comment easily because Batman's creator had an automatic copyright and any commentators would need to get his or her written permission. This was impractical and therefore the law recognised that reasonable use of a small part of that work was not an infringement of copyright. This idea extended to images so that a picture could be taken in an office despite there being an open copy of a Charles Dickens novel on the table. So in most countries you are free to take a small section as long as it is attributed and it does not undermine the original copyright. Wikipedia for instance would allow maybe a couple of paragraphs to be quoted from an academic book or paper with attribution but maybe only half a verse from a short poem. Without attribution Wikipedia allows no text at all to be copied. Copyright of less than ten words has been successfully defended. One issue has been the development of new media such as video, digital photography, CDs, Computer memory, streaming and so on. In most cases the law has been extended, in time, to cover these and the new practice usually either mirrors the existing practice or uses common sense. Some complications have been created where industries that have developed because of copyright such as the US/UK music/film industry have sought legal protection where new technologies undermine their existence. Academic papers can be stored on paper, TED talks, video, flash-memory but the same law usually applies. (e.g. Australian law only allows video to be recorded once and viewed once). The National Portrait Gallery threatened to sue a Wikipedia editor after he copied 3,000 digital photos from their website. The NPG tried to use copyright law to support their business model where NPG would license book owners to use their paintings although those paintings' copyright was exhausted. The case did not fail because the pictures were just binary encodings of the image but because the NPG were claiming that they could take a photograph of a 200 year old painting and claim copyright. Wikipedia believes that this is an ambitious interpretation and they have ignored the NPG's claims. A similar case is in progress in Germany and currently the case has ruled against Wikimedia but is being appealed. The major problem for academics has been academic publishers using copyright to protect their business when the publication via paper declined. That issue is much too interesting so it is outside the scope of this talk (it can fuel some enthusiastic discussion). The entrance gate (designed by Lida and David Kindersley). Kindersley is alive. Why is it legal to show this photo? Copyright soon protected thousands of books and it now offers protection to the 14,000,000 books and 170,000,000 items in the British Library. But there are 500,000,000 tweets per day. I'm not sure every tweet could claim to be original but many of them are. Each of these tweets, every blog, every photo, every film is subject to automatic copyright. If you wanted to Instagram or tweet a screen shot of your computer then you would, strictly, need the permission of author of the academic paper you had open. If you were very thorough (and lucky) then you may be able to agree this with the authors of the paper, but what if they are Korean or Chinese or there are more that 100,000 of them. More problematic is the twitter feed that you meant to crop out of the screenshot. Who is LufbraBoy89 and how do you get his/her permission? Imagine a scenario where you were asked to republish Wikipedia in a new country with traditional copyright law? Wikipedia is written by about 150,000 people and 1,000,000,000 people use it every month. That means we just need to write 150,000 emails and assuming everyone says yes then you can republish it. Luckily there is a solution to this. Wikipedia has to take active measures to preempt classic copyright law. This is because if interpreted strictly, there is a problem should one of the images on Wikipedia be from your paper as you have automatic copyright. Basically 1,000,000,000 people need to stop using the world's top educational web site whilst we wait for Loughborough University's departments to make a reply. The concept of copyright was OK but its run into a Scalability problem. There are a number of solutions to this problem but because of automatic copyright it means that authors need to take measures to prevent 1,000,000,000 people from seeing their new ideas. There has been a great benefit from the concept of copyright. However the concept has become broken. It has become impractical that people should ask permission to quote books and that lawyers would write and other lawyers read contracts to give these permissions. One of the reasons this is not being addressed is that the people who were making money dealing with this problem were the people who were required to solve it. This licensing problem was identified by a number of people like GNU's Richard Stallman but the one I will discuss in detail is Creative Commons. This new license was developed in 2001 and published in the USA. Other licenses are still available but Creative Commons is the heir apparent. Creative Commons's idea was that authors would give their permission in advance for their work to be used, sold or modified. Six types of permissions were agreed and this simplicity means that routine users do not need to read pages of legal clauses. They should be confident that many people have reviewed the terms as reasonable and there is a body of case law which implies that they are robust. Over the past few years these new legal constructs have been linguistically and legally translated for different countries. A few simple icons can be applied in one country and understood in another without the need of lawyers to speak through interpreters. Version 4.0 of Creative Commons gives copyright protection at a global level. Creative Commons is a not for profit organisation who maintain this legal resource. Even if there was not a moral requirement there is a legal requirement to recognise the original author of a particular idea, text, image or construction in Creative Commons. You are able to publish text without attribution but usually the person who uses your work is required to say who made it. If you are however publishing an instruction of how to find the toilets then you may with to mark it as CC Zero. This may seem unimportant but all creations automatically get copyright and you may wish to prevent this bureaucratic overhead or just be altruistic. This concept which is very similar to the concept of copyleft means that anyone is able to re-use your work within their work, but they cannot claim a new and different type of copyright on the combined work. This paper is licensed with a share alike license. So, if you take this sentence and include it in your paper then your paper cannot be sold because it includes my sentence which is "share alike". This allows people to use your work but they are not allowed to make derivatives. You may want people to use the exact words of your poem or the full image of your painting. If this is what you want then this is the correct type of license. This prevents people from cropping your work or re-creating it in black and white or taking your original diagram and just making it much clearer. If your paper is a 50 pages long pdf then this means that no-one is allowed to re-use the conclusions or the summary without including the 237 pages of appendices. Licenses that prevent derivatives from being made are not open licences. No commercial use means that anyone is allowed to use it but they are not allowed to use it commercially. This can be misunderstood. Flickr users who publish their camera snaps use this to prevent that chance image being used. They want to ensure that Gucci pay them before selling tee-shirts featuring their Loughborough university pic in California. This scenario is not very likely. Its more likely that your holiday snap may be useful to someone in Korea who is writing a website in Korean about getting a university education in the UK. Most people would give their permission but its not likely that the Korean author will have time to find the authors name or to email them. Even if that Korean did then how would they know if they were talking to the owner of the picture? Given these four possible restrictions then there are a large number of ways they could be mixed and matched. Experience and logic have shown that there only six realistic combination and these are the possibilities that can be used for your creation. The other possibility is no restriction whatsoever and this is called "C C Zero". Wikipedia was created 16 years ago. It was not intended to be a free, not-for-profit encyclopedia but it was the result of serendipity. It was created when a new encyclopedia (Nupedia) decided to crowd-source the drafting of its new articles. The plan was that the new articles would then be checked by paid experts. It was soon realised that the crowd-sourced version (written in a language called Wiki]] was much larger and more popular than the site it was designed to feed. It rapidly gained readers and contributors and it was cloned into different languages. It is now managed by a not-for-profit organisation in San Francisco. When I first discovered Wikipedia I edited it in secret because I was intrigued. However I also drank coffee in a school staff room and I found it time consuming to deal with pundits stating reasons why they considered that Wikipedia was not going to work and how it was, or could be, full of enormous errors. I clarified my viewpoint when Liam Wyatt and the British Museum invited me to help them collaborate with Wikipedia. Ten of us were chosen to work with ten museum curators to create one new article in a day. We partially succeeded and it was several months before the first article was completed and considered good enough to appear on the front page. This class of article is called a "Featured Article" in my opinion you should be given at least a graduate degree if you wrote one on your own. The most trivial article of Wikipedia is on average viewed once a day and the most consulted articles are consulted about 70,000 times a day. I wrote an article about a statue in the British Museum. I'm not a great writer and I knew nothing about Sri Lanka and the culture that created it, but hundreds of thousands of people saw my new article and 54,000 people read it on one day. Luckily by the time time it was read it had been checked and improved by other authors. That article is still improved and maintained by real and robotic editors. Wikipedia is available in about 300 different languages and you may be surprised to learn that many items in Derby Museum are described not only in English, French, Japanese and Spanish but also in Catalan, Esperanto, Latin and Anglo-Saxon. These articles are not machine-translations but they are written by human editors. Wikipedia does work and critics when challenged fail to find the errors they claim are there. Studies have found that Wikipedia has a comparable number of errors to the Encyclopedia Britannica but Wikipedia's errors can be corrected quickly. Academics are now more interested in why it works. How do thousands of people manage to co-operate? Why can you not see the rantings of disgruntled Loughborough students all over the university's wiki article? OK your high school teacher told you not to use Wikipedia - was she right? Why are a billion people a month doing something your high school teacher disapproved of? What does Wikipedia say about citation? So you think you want to write a Wikipedia article? Wikipedia accepts about 800 new articles every day and it rejects many more. Many new articles are people writing articles about themselves. This is a good example of a subject that is a poor choice. These editors know a lot about themselves but they may have few third party sources. A "letter from your mum" and a cut and paste from your own web site are not good sources. Moreover you have to show that you are notable. Notability is not celebrity. Napoleon's general's may not be household names but they are all notable. For people to be notable there should be an least two sizeable and independent articles about them in reliable sources. Reliable sources may be national newspapers now and historically regional papers, today that would also include reputable websites where there is some editorial control. Wikipedia does not consider itself as a good source. This is because it cannot be shown that the editor was not biased. Some readers think that a Wikipedia article is unreliable because it can be changed, but actually Wikipedia articles keep all their previous versions and any particular version of an article is very difficult to change. Academics increasingly do cite Wikipedia as a source for research. The important point is that citations should include a date/time stamp and you should be sure of what you are referencing. Although Wikipedia does not encourage authors who use it for information to reference it as a source, it is ironic that Wikipedia achieves high ranking in nearly every possible search due to the breadth of its research and the number of times it is mentioned in other people's websites and research. The Wikipedia you use is one of about 300 different languages and each wiki is run by the Wikimedia Foundation. This foundation runs other projects including Wikisource and Wikidata. Wikisource is worth mentioning as that can be used as a repository for documents like this one. Wikisource has converted books into wiki coding. Wikidata is the successor to DBpedia. Wikidata is trying to strip out all the facts from all the Wikipedia's and in addition it is storing millions of extra facts in a quasi-relational database. Wikidata is useful because it can be used to hold the results of research but it also a heavily mined source for research. Wikidata contains the key facts of every notable person, building, law, philosophy and every other noun in Wikipedia. Wikidata has its own ambitions. It intends to capture the details of every painting in the world. Wikidata contains facts and it is licensed with CC-Zero. Lots of sites get lots of hits. Wikipedia differs in that it has surprising permanence. Some Wikipedia articles are edited several times a minute but ideas once included generally stay. They are frequently viewed and enormous and malicious errors are normally found. If your paper is mentioned in a Wikipedia article then it will gain substantially in page ranking on Google. Moreover students who are looking for a quick source to cite for a well known fact in your subject area are likely to use yours because its the easiest one to find. However you are strongly discouraged from adding your own research to Wikipedia. What you can do is to put aside your self interest and use some parochial altruism. Why not improve the biography of your academic heroes? Can you update the articles pertaining to your colleagues research? This approach can be used in a constructive way to do Action Research. I was concerned that 86% of all the notable people on Wikipedia were blokes. Its not in my self interest but I started a paper and as a result the largest single subject web project "Women in Red" resulted from it. This text is available on a Creative Commons Share Alike basis. This means that the text and pictures can be re-used with attribution. The text and pictures may be modified but any resulting work must attribute this document and should not contain any new form of copyright. The images used here are all attributed. Further detail on attribution can by found at https://en.wikipedia.org/w/index.php?title=User:Victuallers/Be_Seen_Be_Read. ^ Bob Kane who was a co-creator of Batman died in 1998. His works will expire in 2068 - unless he was "work for hire". NB:Companies try to extend copyright by re-creating new versions. ^ Cavna, Michael (February 27, 2010). "Batman, Superman comic books set records for sale price". The Washington Post. Archived from the original on April 21, 2012. Retrieved 14 September 2016. ^ Beatrix Potter died in 1943 according to Wikipedia. Her works ceased to have copyright in 2013. ^ a b c d "Copyright, Designs and Patents Act 1988". Legislation.hmso.gov.uk. December 31, 1987. ^ The photo is legal because a) the Wikimedia editor CGPGrey donated the picture with a cc by sa license and b) it is legal to take pictures of 3D scupltures and buildings if they are on permanent public display. This right is not universal. It is illegal in France and Italy to take pictures of new buildings and public sculptures. This concept is called Freedom of Panorama and it does not apply to 2D art like paintings. ^ There are three additional types are available that are used for software. This page was last edited on 11 February 2019, at 15:32 (UTC).